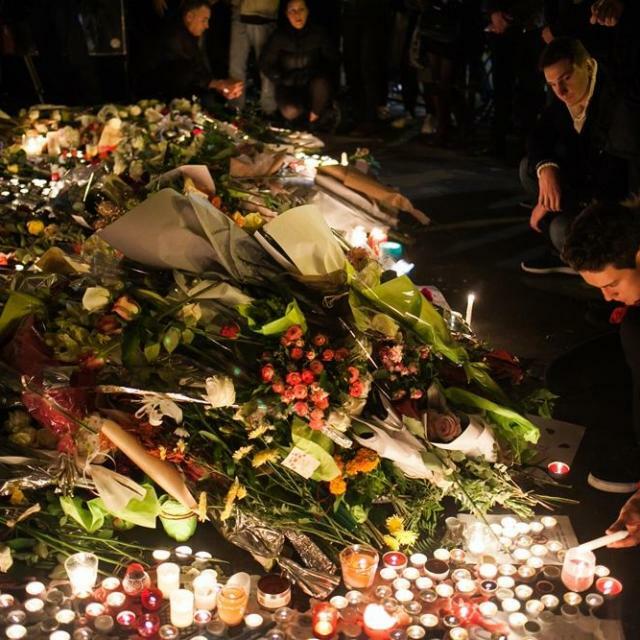 A firsthand account of the terror attacks in Paris, France. Only a few hours after Shabbat had been ushered in, we were walking back home from the shul. It was an unusually warm November night for Paris. 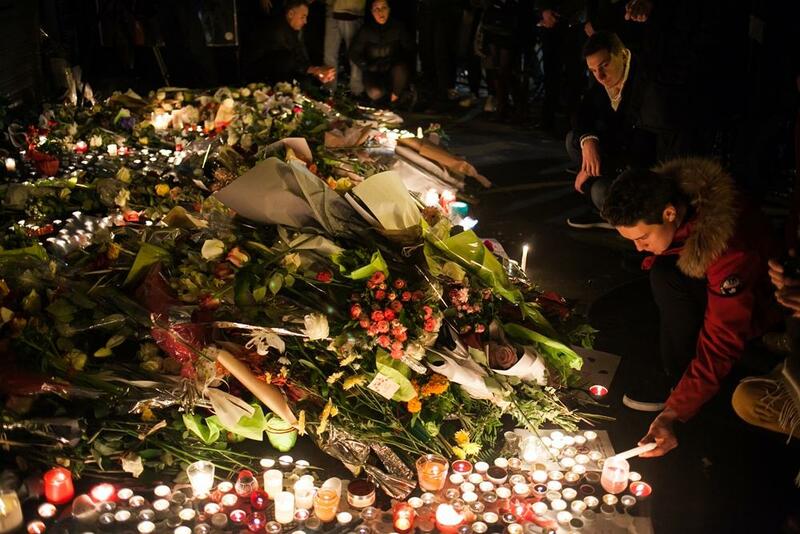 Being Friday night, the 11th arrondissement’s (administrative district) cafés, bistros, restaurants were crowded to overflowig. After 9 PM the traffic was blocked by people gathered in clusters and couples in the middle of the road drinking and socializing. The 11th arrondissement is where all the hip Parisians meet. We were just entering Rue de Charonne, with La Belle Equipe bar just in front of us, a little less than a mile away from the Bataclan. At first I heard what I thought were fireworks. A rapid series of low concussions were immediately followed by the sound of shattering glass. In one split second, it was pandemonium. I heard another blast and felt something whip past my left arm. I saw two young men rush out of the restaurant and throw themselves into a car that sped away as quickly as it had magically appeared. People ran yelling through the streets. In the confusion, I lost sight of my group and I panicked. Enveloped in smoke, I lost my bearings. I heard everyone calling out to his or her loved ones. It was like a nightmare, when you move like you are underwater. I stepped on something wet, squishy, and hard. The smoke was thick and black. It hit my throat and eyes, stinging to the point of bringing tears. Perhaps it was not the smoke after all; maybe I was crying real tears. Never in my life have I been so afraid. Sirens pierced the commotion. People rushed past. I saw someone throw a towel from the apartment above. It floated down like a miniature parachute. I heard someone call out my name, but the place was so brightly lit now, the smoke had become a fog, and I could not see beyond myself. The screaming and crying around me was so loud that it was impossible to determine the location of the person calling to me. I was still on the other side of the road, opposite La Belle Equipe. I always thought myself as someone who in such a situation would rush to help and comfort. A sort of Wonder Woman. Instead, I did nothing wondrous. I was paralyzed by the thought that I might have stepped on someone’s limb. How could a limb be there, on the other side of the street, without the rest of its body? I recall someone touching my arm, gently, saying my name. The Rabbi’s eyes were so huge they seemed to eat his whole face up. He was chalk white. He asked me if I was okay, and told me we had to find a member of our group and help them. Someone bumped into us, staring ahead to some invisible point beyond us. He was staring right through us. Seeing his daze tore me out of mine. I realized that the police, the army, and four or five ambulances had arrived. There were press, too. Now the streets were crowded with police and soldiers all heavily armed. It was a new chaos. They asked us for identification, but because we were observing the Sabbath, we had nothing on us. We stayed a while longer, answering endless questions from doctors and investigators. We filled in declarations and made statements as witnesses. I don’t know how many papers we were asked to sign. Thankfully, we were sheltered from the press. When at last we left, it was almost 2 AM. The area was secured and sand had been spread to soak and cover the blood. Someone cried behind us, « Les voilà! C’est la faute des Juifs! » (“There they are! Blame it on the Jews!”) I turned quickly around to see a group of young people. One spat at us. They took a step forward. A police officer turned, gun pointed. They raised their arms, as if to apologize. "Yes. Sorry, Jews. We apologize that we always blame you- but we don’t actually mean it." Lunatics break into a restaurant murdering nineteen people, wounding eighteen, one of the seven attacks that would kill a total of 129 people and injure 342. That’s what the official reports tell us. Yet, somehow all this must be because of the Jews. Somehow, we are always involved. The world has yet to realize the enormous blessing the Jewish people bring. I spent the rest of Shabbat dozing. Had I run the New York marathon, I think I would have been less exhausted. I felt shame for having been no hero, and I have a few serious complaints to the Master of the Universe for what happened. But one has to move on, hasn’t one? The Prophet Zechariah says, “I shall make you movers (mehalchim) among these who stand still (omdim)” (Zechariah 3:7). Angels might well be called "omdim (those who stand still)," but we human folks are "mehalchim (those who move)." Neither words, nor time have ever healed anyone. Only living heals. To me, this means I am meant to live, chipping away bit by bit at all that prevents me from being a Jew faithful to G-d, his Torah, and the traditions of our fathers. To me, this means living through time and ultimately beyond time, where neither therapists nor surgeons will any longer be needed to soothe the pain and mend the wounds. May HaShem take all this, together with the 24/7 terrorism in the Land, and, somehow, transform it into a blessing. May we be worthy of it, and of Your protection. Please shelter Your precious people, wherever they may be, and Your precious land, our one true home. And may Messiah Yeshua come again, speedily and in our days. About the Author: A young Messianic Jewish woman living in Paris.